A monochrome home exudes sophistication in its purest form. But lets be honest here, some have that certain level of vapidity that puts it at the level of 'just satisfying'. Rock star interior designer Ryan Korban has taken the said factor out of the equation, and instead, he replaced it with something that stirs the spirited, non-conforming factor in all of us. Whether silently or loudly, every home broadcasts the owners character and beliefs in one way or another. The collection and the homes entirety are shaped by the one who lives in it. It is dictated by what he's comfortable with and what he loves. A great interior designer doesn't mute that; he highlights them. In this particular abode, Ryan Korban demonstrated the art of dressing a place with a pantheon of refined style amidst a sea of rough luxe. Each space exhibits the dynamic spirit of the owner through his artwork. As expected, almost every room in this New York City pad is decorated with a zebra skin rug. The interior genius is known to incorporate that in his projects and in his own home as well. Both felted and non-felted zebra hides graced the floor of this home with an attitude. Don't hesitate to double up on the floor accessory if your area permits you to! Some place a zebra rug on top of another one just like this; but if you've got a wider space, place an artwork or another rug beside it such as the one above. In our book, an interior with extreme themes has always and will always be highly impressive. A combination of traditional and contemporary furnishings with metal details adorns the space. The living room is the only area in this loft with colored pieces by way of the cool wall art. An angled zebra rug anchors the whole area perfectly. It adds a luxurious contrast to the edgy ambiance. Cloaking the walls, ceiling, and floors with immaculate paint is a brilliant move. This serves as a great background to showcase one's creations just like in a museum. It also complements the busyness of the art pieces. 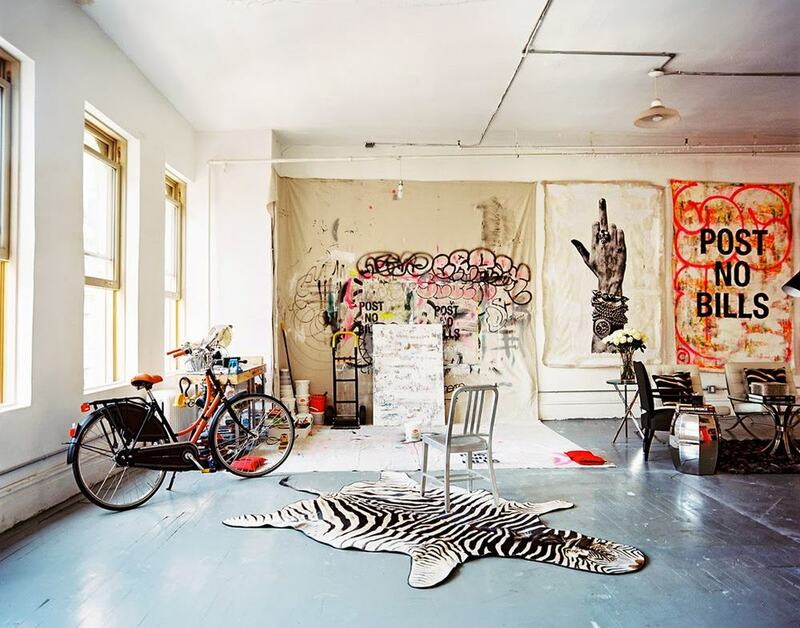 At a glance, the whole area looks like a punk rock enthusiast's dream! But if you take a closer look, meaningful possessions that exemplify savoir vivre are scattered all over the place, and that makes this amazing refuge extra special. 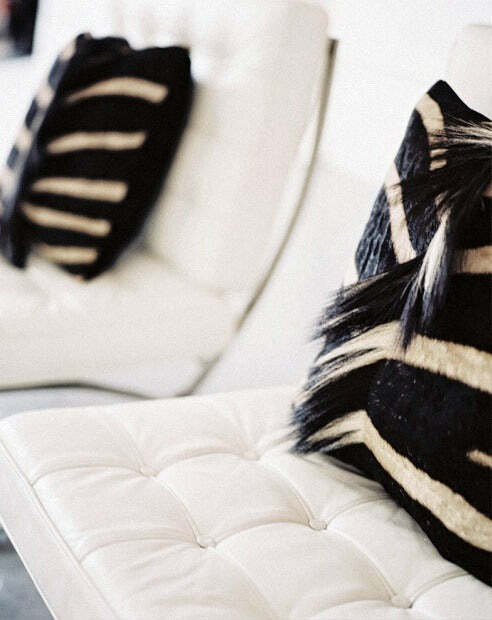 A pair of gorgeous zebra skin accent pillows spruces up an all-white tufted sofa. If you prefer more variety, throw in a couple of other pillows in different textures, but still sticking to the monochrome theme. The different textures will kill the banality of a dual-toned arena. At its very core, simplicity dominated the entire area. Unnecessary clutter is eliminated, leaving room for what really matters, and for an eventual outcome of artistic thoughts; and if you're a person who constantly create exciting masterpieces, that's how you would want it to be. Shop our hides! Sponsor: Paulski Art is a supplier of authentic and handmade Kuba Cloth Pillows from Congo.